Four-color process printed on Side 1 of 16pt C1S White Semi-Gloss stock. Coated with Aqueous Gloss. H2 business card slits on both pockets. 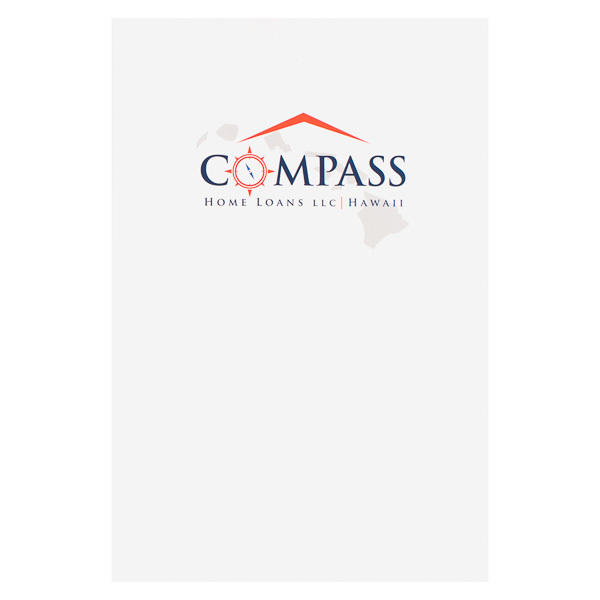 Blue and orange color branding tells customers much of what they need to know about Compass Home Loans. Its blue serif text implies reliability, while the orange accents suggest efficiency. The logo's many images also describe the company. An orange peak above "Compass" looks like a roof, alluding to purchasing a home. The "O" is shaped like a compass. Behind the text, a map of Hawaii reveals the company's location. Your personal information is worth protecting. With this product, 8 1/2" x 14" contracts, tax returns, and other legal papers stay safe and sound between two ultra-sturdy panels. 1" reinforcement strips along both panels help protect documents from prying eyes, rough handling, and general wear and tear. Two interior pockets have a flexible v-split design to prevent buckling when closing the covers. Print color or custom writing on the pockets and reinforced edges to bring a colorful touch to the interior. Dimension Closed: 9 3/4" x 14 1/2"
Dimension Open: 19 1/2" x 14 1/2"